As the Eurozone unveils both a rescue package for Ireland as well as a blueprint for dealing with sovereign debt crises post 2013, it is a good time to muse on the future of the euro as a currency. To begin with, there were at least two design flaws in the euro, one economic, the other political (both were well known at the time). From an economic point of view, a common monetary policy works only under synchronized business cycles and similar inflation rates. The business cycles, however, were never too aligned in the Eurozone: from 2001 to 2007, the fastest growing country was booming at 5.8% a year, while the slowest was almost in recession, growing barely at 0.3%. Some countries needed tight monetary policy, while others would have benefited from monetary expansion. Inflation too was varied. At any given year, the country with the highest inflation in the Eurozone had an inflation rate that was 3-4 times higher than the country with the lowest inflation. A basket of goods would have appreciated by 7% between 2000 and 2007 in Finland, while it would have appreciated by 22% in Greece. Average inflation was stable, but there was great variation among members, making a common monetary and exchange-rate policy too impractical for all. The second flaw was political. While monetary policy was too rigidly similar, fiscal policy was too loosely dissimilar. The Eurozone included only high level fiscal boundaries – deficits should not exceed 3% of GDP and debt levels should be under 60% of GDP. But when countries started to exceed these limits in 2005, the Council of Ministers did nothing to punish them. At issue was an ambiguity about what precisely a common currency meant. In theory, countries retained fiscal authority and had the freedom to run their own accounts. In theory also, the debts of a country were strictly its own. In practice, however, there was a great convergence in bond yields: the standard deviation in bond yields among the Eurozone members was 70 basis points in 2001. In 2007, it was 13 basis points. So by 2007, markets saw no difference in the riskiness of the debt of the Eurozone members. Greece was Germany and Ireland was France. The problem was that there was no way to know what would happen if a country got in trouble. There was also no mechanism for the Eurozone to prevent a country from getting into trouble in the first place. Here, then, was a contradiction: the markets were treating debt created in the Eurozone as equal but the prudent members had no way to restrain the profligate ones. The events of the past few years allow us to revisit those initial dilemmas. The synchronicity issue has proven to be extremely important. Higher than average inflation rates in Greece and Ireland, for example, fueled borrowing and undermined competitiveness. Rigid exchange rates will also hinder recovery as these countries cannot depreciate their currencies to make exports instantly more attractive. Instead, they will need to experience either outright deflation (Ireland) or slower than average inflation (Greece). For these macroeconomic challenges, nothing that has happened in the past twelve months has provided any solution. On debt, the message so far is mixed. On one hand, the markets were foolish to treat Greek debt the same was as German debt. On the other, they were not. Germany did, in fact, step in to help. Greek debts did become European debts – at least for now. Spreads shot through the roof, indeed, but at the end, spreads measure not the riskiness of individual country bonds; rather, they measure the political appetite in Germany to keep bailing out the more spendthrift members of the union. And the volatile in that appetite is as high as the volatility in the spreads. None of this is a surprise, and the founders of the euro were well aware of its limitations, though perhaps they may have under-appreciated the magnitude of the crisis in which some countries have found themselves. For some smaller countries, the membership in the euro has brought clear benefits, even though it has also entailed some real costs. A Greek poll in November showed that 60% of the people thought the country should default or restructure, but a full 69% thought that it should stay in the euro. No drachma longing here. The question is more for Germany – does it benefit from the euro? Many people say that instead of Greece and Ireland leaving the euro, maybe Germany should. But the question is this, does it matter? Instead of asking, do the new provisions provide enough guarantees to Germany that it can restrain profligate spending, the question to ask is, does Germany’s commitment to bailing out a fellow European depend on euro membership? If one looks at the rescue packages for the non-euro members of the European Union (Hungary, Latvia and Romania) all involved a combination of both IMF and EU money. Euro or no euro, bailing out fellow Europeans might happen either way. And euro or no euro, Germany and others need more measures to monitor behavior and punish excesses. How can this monitoring coexist with basic principles of democratic government? As a matter of principle, it cannot. A Greek who votes for parliament and prime minister needs to know that these bodies will have power to wield – decisions on how much to spend and tax should come from politicians at home, not politicians and technocrats abroad. But this just in principle. In practice, this is precisely what happened to Greece: bureaucrats from the IMF, the ECB and the EC are telling Greece how to run its affairs. I guess where all this brings us is this: the fundamental economic and political dilemmas that came with the birth of the euro have hardly been resolved. 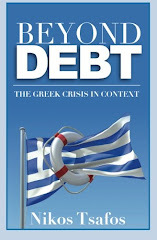 The market presumption that Greek debts are German debts was foolish – and then correct – until now at least. And the messy debates to avoid meddling in domestic fiscal affairs have become moot at the point when the sovereigns in crisis called for help. So much resolved and nothing resolved. How Important is Shipping for Greek Trade? How Dependent Are Greek Banks on ECB Funding?